Alexandra Buse has graduated the School of Stomatology of the University of Southern California from Los Angeles, in 200. During the years 2000 and 2001 she practices stomatology in Los Angeles. Alexandra Buse later returns to Romania where she becomes specialized in general stomatology at UMF Carol Davila Bucuresti, between the years 2003-2006. Since then she has attended specialization classes in fixed prosthodontics, dental faces, occlusions and esthetic dentistry. 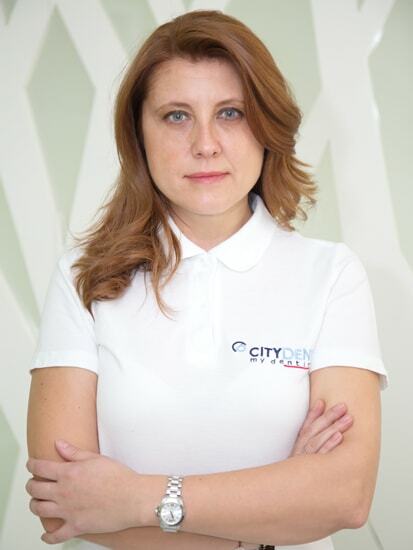 She is a member of the Society for Esthetic Dentistry in Romania and has been practicing general stomatology and cosmetics at CityDent, since 2010. Dr. Alexandra Buse is a MD dentist dealing within the clinic with prosthetics: inlays, onlays, crowns, both full ceramic and zirconium.